Permalight foamy bumper guards, made of recyclable polyurethane foam, have an alerting daylight-color yellow with black contrast stripes. 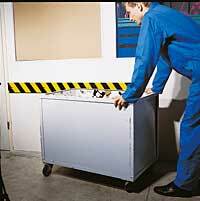 These bumpers help prevent injury when bumping into protruding corners, obstacles or sharp edges. The 39-3/8-inch long strips with 1-9/16-inch diameter come in six shapes. Remove the protective silicone liner and press-apply the adhesive-backed strips.